Beginning, November 1, 2018, The Crescent will be open for tours Wed – Fri 1-4 P.M. Admission will be charged – $5 for adults. Children under five are free. from 1-4 PM at regular open hours. What a beautiful way to celebrate the holidays all through the year with a beautiful and durable Crescent Keepsake, for yourself or for someone on your gift list. Stop by The Crescent Wednesday thru Friday from 1-4 or just use our PayPal for your holiday purchases. The price is $25.00 for one, but with orders of 5 or more – $20.00 each. A great way to support The Crescent and to share our iconic home with friends and family. The May Crescent Tea will be postponed due to its proximity to the Youth Flower Show. The Annual Meeting of the Garden Center of Valdosta, Inc will be held March 12, 2019, at the Valdosta Country Club at 11:30 A.M. The Crescent in Valdosta, Georgia, is owned and operated by The Garden Center, Inc. of Valdosta, Georgia, a 501(c)(3) organization. Please consider making a donation to help cover the needs of the Crescent. 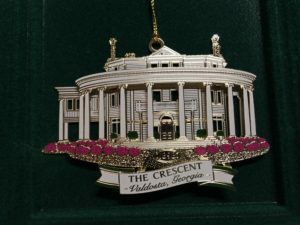 The Crescent has been a national treasure in Valdosta, Georgia, for more than 100 years. Owned and operated by the The Garden Center of Valdosta, Inc., the Crescent is a lovely and elegant venue for Weddings, Receptions, Family Reunions, Business and Club Meetings, and other special events in a historical setting. The formal gardens have a small chapel and are ideal for outdoor or intimate weddings. The large Reception Hall is adjacent to the Gardens and the Crescent. Click here for directions to the Crescent. “The Crescent,” a landmark home on the National Register of Historic Places, was built by Col. William S. West in 1898. He built the neoclassical, crescent-shaped front porch, 23-room home for his family. The Crescent is on the National Register of Historic Places. In 1951, three ladies in the Garden Club saved the demolition of the West’s former home, and it became the home of all the Garden Clubs in Valdosta. The Garden Center encourages anyone interested in gardening, beautification, education about plants and flowers, or joining a garden club to call The Crescent (229-244-6747) and leave a phone number and name. All Valdosta Garden Clubs welcome new members and are glad to share their wonderful programs with the community. For rentals, contact us by phone at 229-244-6747 and leave a message for the Rental Consultant to contact you or click the link below for email inquiries. Also, please complete the no-obligation form on our General Inquiries page for a temporary reservation.